All data taken from ReColorado, on March 18, 2019. Denver, Colorado. Average Price of both Single Family homes and Attached homes Year over Year in February has increased to $454,204 an 2.1% increase.. Inventory as of the start of March 2019 increased by 39.1% year over year. When supply goes up prices go……. 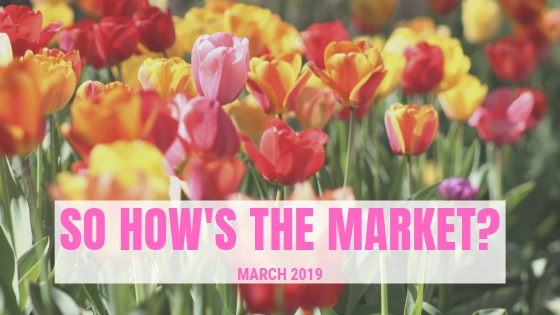 And the market is leveling off as the number of new listings taken for single family homes in February was 4,703, a 7.6% increase over February 2018. Sellers in the price ranges below $600,000 are still experiencing a favorable market to sell within. Days on the Market to Sell a Home increase by 25% from February of 2018 to 40 days on the market. We are on a pace for smaller appreciation gains in Denver real estate for 2019. Interest rates for mortgages remain stable for the first two months of 2019. The Federal Reserve, FNMA, NAR and most economist would suggest rates will rise slightly in 2019 to 4.5% to 4.75%. This will slow the buying power a little. However, we encourage buyers to buy now, as interest rates rise, your buyer power decreases and there is little chance of prices reducing at this time. a. Current Homeowners are enjoying their low interest rate payments and will not move. b. The lower level of inventory keeps sellers off the market because they cannot find a home to move into at a price they can afford. c.	Personal Incomes are starting to rise but are not close to the home appreciation pricing Denver has enjoyed for 5 years. Employment growth and stability in the overall economy bodes well for Denver housing to continue at a strong pace for units sold for 2019 albeit lower than 2018. Sellers will have the upper hand in the lower price ranges with inventory levels below 2 months of supply. Be Ready To Buy! Homes below $750,000 are moving quickly. Know you will not have much room for negotiations during inspections. Understand the condition of your new purchase very well. Real estate is a very localized product to neighborhoods. Study the data from the area you want to live and compare the research for that neighborhood over time to understand the trends. Appraisers are finding it hard to stretch the market as inventory grows and days on the market increases. Have a strong strategy to get your home appraised before taking it off the market on the highest offer. It’s Springtime, make your home front sparkle from the street to attract the most traffic as best you can.